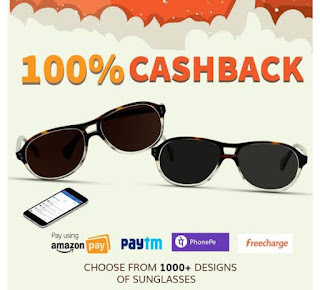 Coolwinks – Get 100% Cashback upto Rs 1500/1600 on First 2 Transaction via PhonePe/Paytm during the offer period. CoolWinks® was founded in 2016 with a clear focus on providing better vision to millions with quality eyewear. We are aiming to be a leading online retailer of vision care products with the highest standard and widest range of Eyeglasses, Prescription Sunglasses, Sunglasses along with specialty brands and lenses. So Hurry up and avail this offer !! 9) Apply Coupon: inqpum or ojwt36 to get 1% off on your product. (Valid on Coolwinks App) You can use EYE10 for 10% Off on Eyeglasses and use SUN20 (Not valid on JRS branch) for 20% off on Sunglasses. Make sure Payable amount should be Rs 1500/1600 from PhonePe/Amazon to Get Rs 1500/1600/ Cashback !! 10) Make sure Final payment should be Rs 1500 then, Choose the payment mode as “Paytm/PhonePe” and pay amount. 11) You will get the 100% Cashback upto Rs 1500/1600 in your Paytm/Freecharge wallet instantly. Note: You may not be able to see “offer” on phonepe payment page, But you will get the Cashback instantly for sure !! If anything goes wrong you can cancel the order before shipping or returned after delivery !! No customer is allowed to place more than 4 orders in a span of 24 hours with his/her registered e-mail id/ phone number on Coolwinks. Any/all such orders will be cancelled with no prior intimation to the customer..
Get Scratch Card worth Rs. 1500, on a min order value of Rs.1500. Offer is valid from 01st February 2019 (00:00 Hours) to 14th February 2019 (23:59 hours). Payment to be made through BHIM UPI, Debit Card, Credit Card or Wallet within the “PhonePe” option on Coolwinks checkout. For users paying through UPI, scratch card is valid on transactions initiated and completed on PhonePe using a PhonePe linked bank account. Scratch Card is offered by PhonePe. Scratch Card amount will be credited as PhonePe gift voucher balance within 24 hours of successful completion of the transaction. In case of full cancellation/return, the scratch card amount offered will continue to remain as PhonePe gift voucher balance and non-withdrawable to your bank account. This can continue to be used on PhonePe (recharges, bill payments, etc.) Refunded amount less of scratch card amount will be credited back to the source of funds used while making payment. Offer is valid from 5th January 2019 (00:00 Hours) to 31st January 2019 (23:59 Hours). This offer is valid on Coolwinks Desktop & Mobile Website. In case of cancellation, the cashback given on the transaction will continue to remain in FreeCharge wallet. Refunded amount less of cashback will be credited back to the source of funds used while making payment. Note:- Customers who have availed the cashback offer from FreeCharge in the month of September – December 2018 are also eligible for this offer in the month of January.